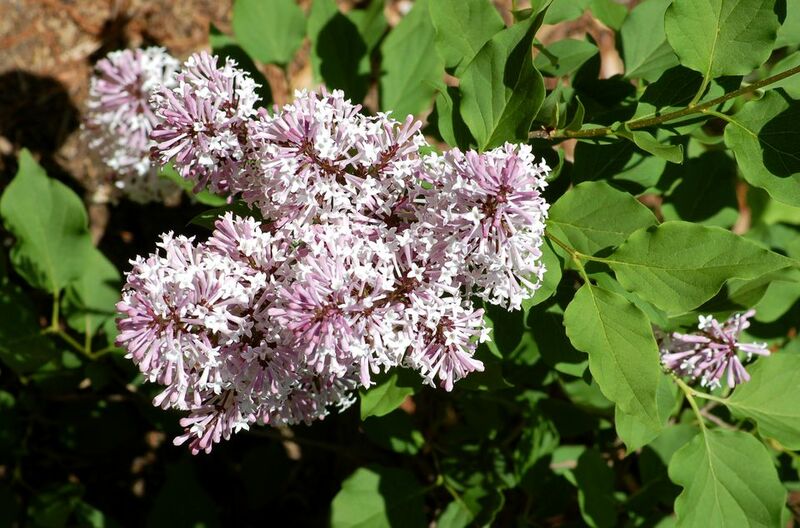 The Miss Kim lilac has smaller flower clusters and is a smaller shrub than the traditional common "French" lilac. Being compact, it is a good choice if you're pressed for room in your yard. Its flower buds are less likely to be damaged by frost as it is a later-bloomer. The foliage picks up some red or burgundy in its leaves in autumn, making it an attractive plant three seasons of the year. These bushes are plants that attract butterflies, and their flowers attract hummingbirds, but another advantage is that they are deer resistant. Miss Kim lilacs have a strong fragrance that differs from common lilacs. Botanical Name: Syringa pubescens subsp. patula "Miss Kim"
Miss Kim is suitable for foundation plantings, placing in the front of a border, or using as a low hedge. As is usually true of Syringa species, it's a good idea to promote air circulation to prevent powdery mildew by giving the plants enough spacing. The Miss Kim cultivar is sometimes called a dwarf, but compact would be a better description for it. It is a slow grower, so a smaller plant will take its time reaching its full potential. You generally don't have to wait as long for the first blooms on a newly installed specimen as you do with the common "French" lilacs. Opinions vary on the strong fragrance of Miss Kim lilacs. The scent of the common "French" lilac (Syringa vulgaris), is powerful but sweet, whereas Miss Kim's flowers smell overly sharp to some. Let your own nose decide. Deadheading the flowers after they fade will help produce increased blooming next year, as well as possible reblooming in the current year. The Miss Kim lilac, like its cousins, prefers full sun in order to bloom well. Select a location that will get sun for at least six hours per day. Install this flowering bush in well-drained soil with a neutral soil pH. Ideally, you'll want to work some compost into the ground, but Miss Kim isn't overly fussy about soil and is likely to succeed with just a little effort on your part regarding location and site preparation (in fact, it's even reasonably pollution-tolerant). The watering needs of the plant are average, so keep the soil evenly moist. When establishing a new plant, water it well. After it is well-rooted the plant will tolerate drying out now and then. Monitor the soil and if the area is dry, give the lilac some water. Watering weekly will be sufficient in most climates, but you may need to water more often in cases of extreme heat. You don't want to overwater or underwater your Miss Kim or it may not bloom. Miss Kim lilacs are hardy in zones 3 through 9, so they can survive and thrive in the Southern States as well as the North. Use a little all-purpose fertilizer during the winter. But don't fertilize in the spring or your lilac may not bloom. S. pubescens subsp. julianae "Hers" has a weeping form. Syringa meyeri "Palibin" is hardy in zones 3 to 7. It grows 4 to 5 feet tall by 5 to 7 feet wide and has pale pink flowers. Syringa meyeri "Tinkerbelle" is hardy in zones 3 to 7. It grows 6 feet tall and wide and has wine-red flowers. Syringa x meyeri "Josee" is hardy in zones 2 to 8. It grows 4 to 6 feet in both height and spread and has lavender flowers. Syringa x "Bloomerang" is hardy in zones 4 to 7. It is a true dwarf at just 3 to 4 feet in both height and width. It has purplish-pink blooms and is named for its ability to rebloom. It is a hybrid of "Josee." Miss Kim lilacs don't require the amount of pruning that Syringa vulgaris does. But you may choose to prune it to shape the plant and promote reblooming. Prune right after the blooming period, since the bushes bloom on old wood. If you prune too severely you might not see blooms for one to three years. Once the blooms have gotten smaller, you have the go-ahead to prune. Miss Kim doesn't sucker the way Syringa vulgaris does. This means lower landscape maintenance on a property with limited space, where you would have to remove the suckers so as to keep the plant contained in the space chosen for it.